I am a Certified Dog Trainer and Holistic Behavior Coach, Reiki Master and Energy Healing Practitioner. I help integrate mind/body/spirit balancing and improve people's relationships with their dogs. This helps owners raise their vibration and dogs reach their highest potential. My vision since 2007 is that dog owners should know how to teach their dogs moral, ethical, and social skills. Force, pain, and stress-free training administered with love and affection can turn training into a bonding experience between you and your dog. No matter where you live, the holistic training approach can become part of your life. SO WHAT IS “HOLISTIC DOG TRAINING”? Holistic Dog Training- or Holistic Dog Parenting- is an emotional/relationship based method that uses the law of nature that a whole is made up of interdependent parts. An individual dog is more than just an animal to be controlled. Emotions, energy, and health are all involved in creating and maintaining a positive human/dog relationship naturally, for life. I do this with clients around the globe, both in person and online.Holistic training does not subscribe to Dominance or Alpha theory where the dog owner relies on fear, threat or power imbalance in order to get the dog to obey (I believe that this creates an ongoing battle, one you’d likely rather not fight forever, and, moreover, compulsive training can cause even BIGGER problems down the road). I work with dog’ guardians to correct and balance the system, strengthen trust and communication, and tap into your dog’s natural tendencies, skills, and breed-specific needs. 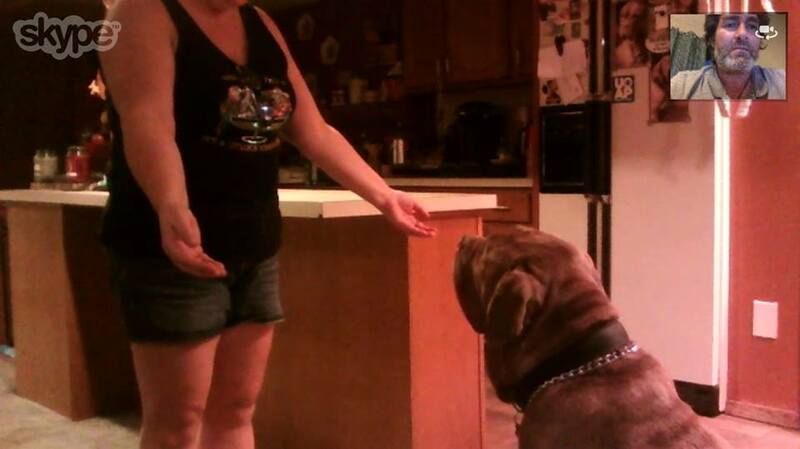 This approach creates a happy, well-adjusted dog who is tuned into you and who naturally WANTS to obey. No more power struggle, nor more frustration. My holistic methods work quickly and powerfully, and in far fewer sessions than most trainers need. Your bonded connection with your dog, facilitated by my coaching, will provide you with the confidence and tools for a happy, well-behaved, best friend for life. I believe anyone can learn to be a master trainer of their own dog. Yes, even when there are “BIG” problems to solve!. YES! You can learn to be your dog’s best trainer, in the comfort of your own home, from anywhere in the world. Using online video chat, I personally guide you and your pet toward a happier, more peaceful relationship. When we partner to train your dog via Skype, Facetime or other app, YOU are the star of the show, “the only trainer in the room”, working directly with your dog (with my careful guidance). Ready to schedule your first online session? Want to talk about your dog’s needs with Roman first? Click here to set up a free phone call. Your bonded connection with your dog, facilitated by my coaching, will provide you with the confidence and tools for a happy, well-behaved, best friend for life. I believe anyone can learn to be a master trainer of their own dog (yes, even when there are “big” problems to solve! ).